Source: David Friedman, Chapter 1: What Does Economics Have to Do with Law? This entry was posted in David Friedman, economics of regulation, law and economics, politics - New Zealand and tagged avoiding difficult decisions, housing habitability laws, living standards, New Zealand Labour Party, offsetting, rent control, The fatal conceit, The pretense to knowledge, unintended consequences on May 5, 2016 by Jim Rose. @StatModeling @ryanmcmaken Europe sub-Reddit just can’t handle the truth about how poor they are!? 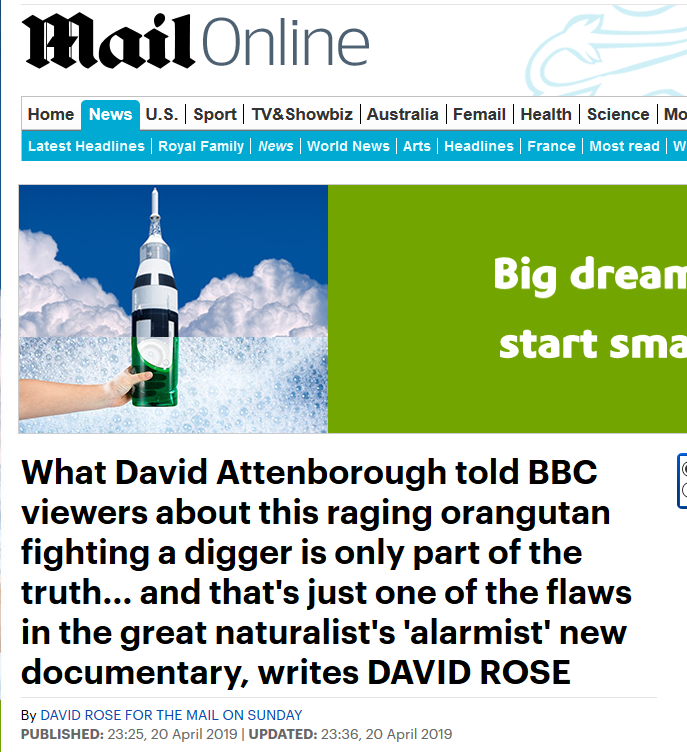 This entry was posted in applied welfare economics, economic history, economics of media and culture, politics - USA and tagged European Union, living standards, rational ignorance, rational irrationality, Reddit on April 17, 2016 by Jim Rose. This entry was posted in economic history and tagged industrial revolution, living standards, The Great Enrichment, The Great Fact on March 7, 2016 by Jim Rose. 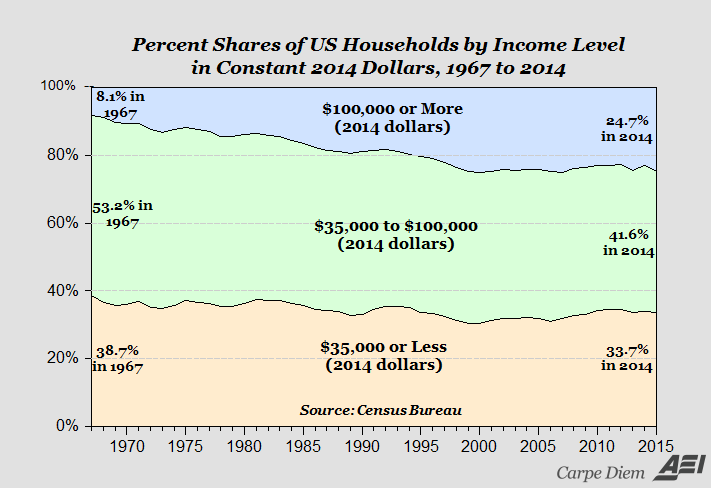 Both the proletariat and the middle class are withering away these days thanks to capitalism and freedom. 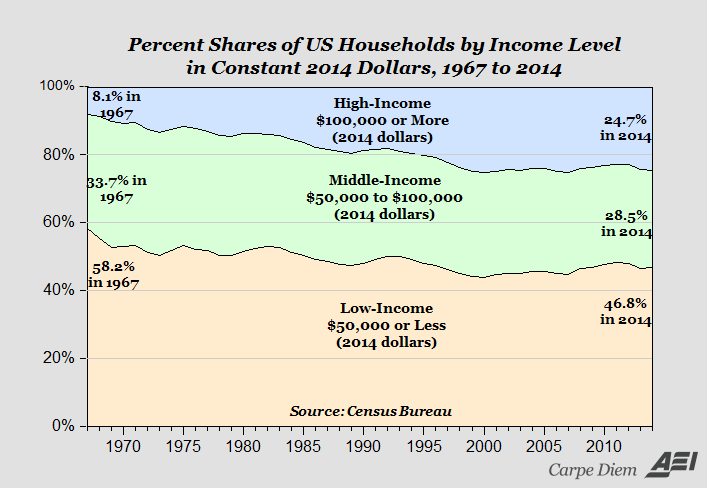 Source: Charts of the day: Another look at how America’s middle class is disappearing into higher income households – AEI | Carpe Diem Blog » AEIdeas. This entry was posted in applied welfare economics, economic history, labour economics, politics - USA, poverty and inequality and tagged living standards, rational ignorance, rational irrationality, withering away of proletariat on February 8, 2016 by Jim Rose. This entry was posted in econometerics, economic history, labour economics, minimum wage, politics - USA, poverty and inequality, welfare reform and tagged living standards, social insurance, welfare state on February 8, 2016 by Jim Rose. This entry was posted in applied price theory, applied welfare economics, economic history, labour economics, labour supply, unions and tagged 40 hour week, hours worked, living standards, union power, union wage premium, working hours, working week on January 31, 2016 by Jim Rose. 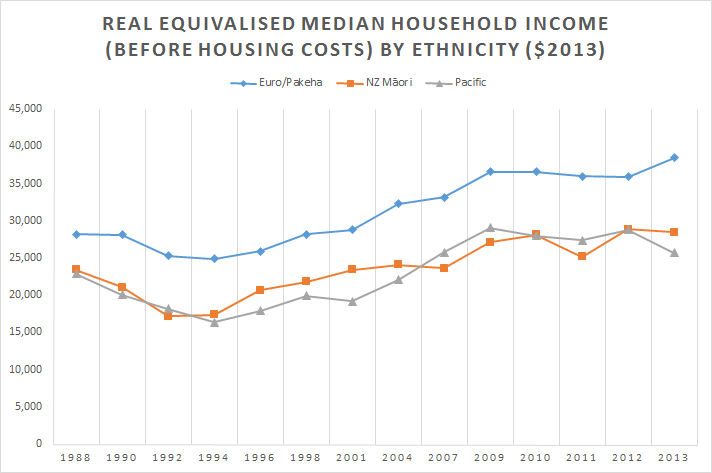 Pakeha and Pasifika real household incomes increased by 55% since the low point of 1994. Maori household incomes increased by 65% since 1994. Source: Bryan Perry, Household Incomes in New Zealand: trends in indicators of inequality and hardship 1982 to 2014 – Ministry of Social Development, Wellington (August 2015), Table D.6. This entry was posted in economic history, labour economics, politics - New Zealand, poverty and inequality and tagged child poverty, family poverty, Leftover Left, living standards, Maori economic development, Twitter left on January 8, 2016 by Jim Rose. 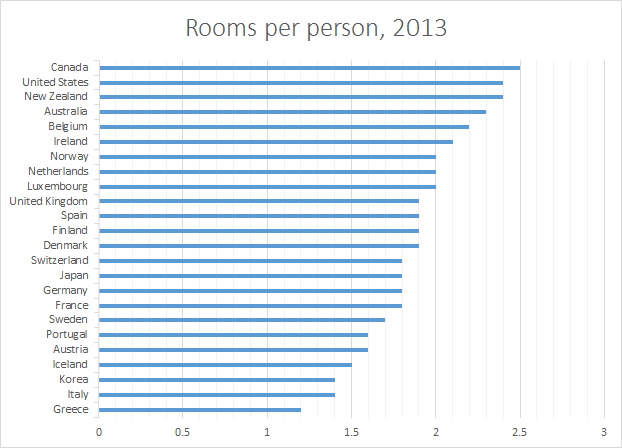 There are quite large differences in the number of rooms per person in the European offshoots and the countries in Europe. Americans have much more room per person than the much exalted welfare states of northern Europe. This entry was posted in politics - Australia, politics - New Zealand, politics - USA, population economics, urban economics and tagged housing economics, living standards on January 7, 2016 by Jim Rose. This entry was posted in economics of media and culture, industrial organisation and tagged creative destruction, Internet, Internet access, living standards on December 16, 2015 by Jim Rose. This entry was posted in applied welfare economics, development economics, economics of media and culture, entrepreneurship, growth miracles, industrial organisation and tagged cell phones, creative destruction, international technology diffusion, living standards, mobile phones, technology diffusion on November 26, 2015 by Jim Rose. It is those below median household income that are suffering more from rising housing costs in New Zealand since 1982. Those on low incomes in particular have suffered the most. Source: Bryan Perry, Household Incomes in New Zealand: trends in indicators of inequality and hardship 1982 to 2014 – Ministry of Social Development, Wellington (August 2015), Tables D3 and D4. The data for the lowest decile is somewhat unreliable because there are so many implausibly low and zero incomes in that decile. 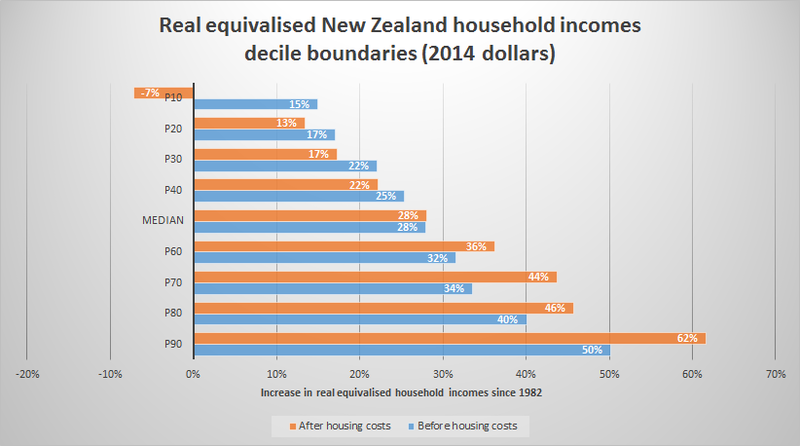 This entry was posted in economic history, politics - New Zealand and tagged housing affordability, living standards, RMA, The Great Enrichment on November 7, 2015 by Jim Rose.